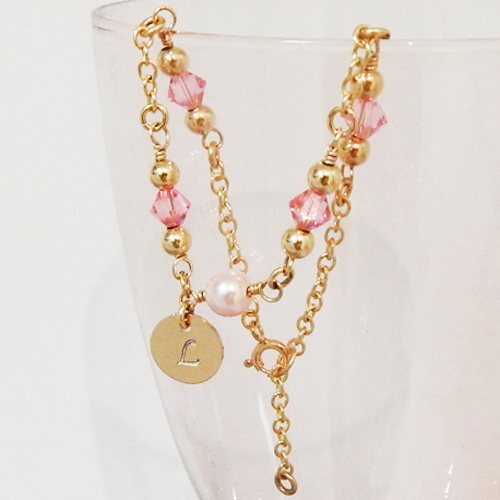 Beautifully delicate and girly, this pretty bracelet is created from all gold-filled products (far superior to regular gold-plate), Swarovski crystals and features a Swarovski pearl in the centre. A tiny round disc is stamped with a single upper case letter to add the perfect personalised touch. Please Note: This bracelet will be made with the utmost of care but please be aware it is a special-occasion jewellery piece rather than every-day wear. Due to the number of small components creating a possible choking hazard if broken, we do not recommend it is worn by a child under the age of 3. Turn-around time for your personalised bracelet is usually 5 - 7 days. Please allow extra time if requesting different colour crystals or sterling silver components.